Pardon The Punctuation...If you've watched as much "Iron Chef" as I have, chances are you've sat at home and dreamt for the day you'd get to eat at one of your favorite Iron Chef's restaurants. Last night one of those dreams came true. "The National" in midtown Manhattan comes to us from world renowned chef Geoffrey Zakarian. It's been on my list for over a year now and it was well worth the wait. The menu has just the right amount of items and the ambiance was fun and relaxed. Once inside the dimly lit bar and dining room feel like you've travelled back in time...in a good way. This night there was a jazz quartet playing standards...nice touch. My waiter "Ronnie" guaranteed me that I'd love what he recommended. He rocked and here's what he recommended. Grilled Octopus: with chorizo, fennel, cannellini Bean, and piperade. 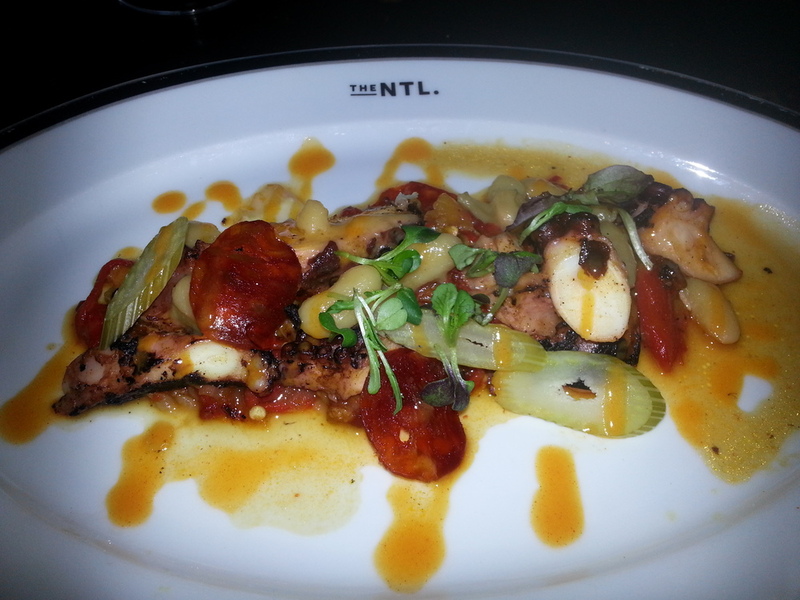 Loved the salty chorizo with the perfectly grilled octopus and the beans were a nice touch. The “Ugly” Burger: with pickled jalapeño, NTL. sauce, housemade pickles, bibb lettuce, and hand-cut fries. Top 10 burgers I've ever had the pleasure of scarfing down. The fries were highlighted by some delish house made ketchup which forced me to eat more than my tummy needed. Great food and great service make "The National" a place that will always be on my list when I'm in New York. Next time I'll have to try some dessert as I was too stuffed from that burger to gorge myself on the sweet stuff. "In Ronnie we trust" should be their new slogan.